This is THE BEST NO BAKE CHEESECAKE RECIPE EVER! 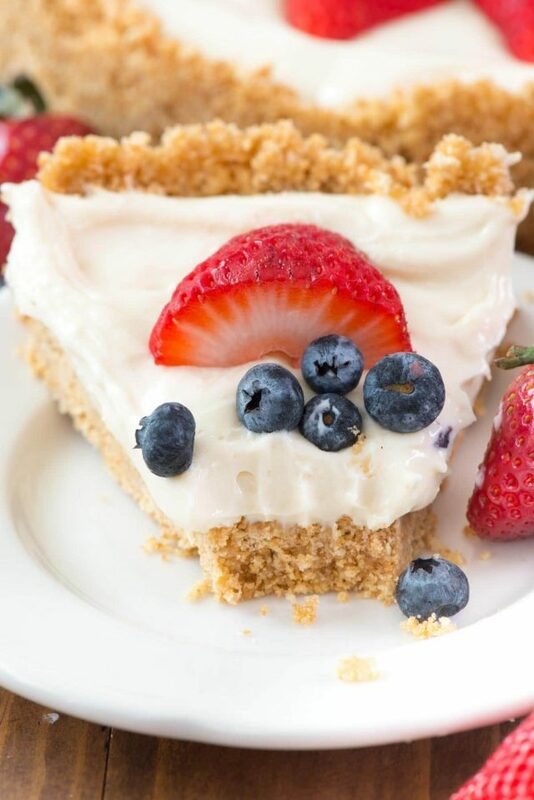 It’s got a thick graham cracker crust and an easy no-bake cheesecake filling. 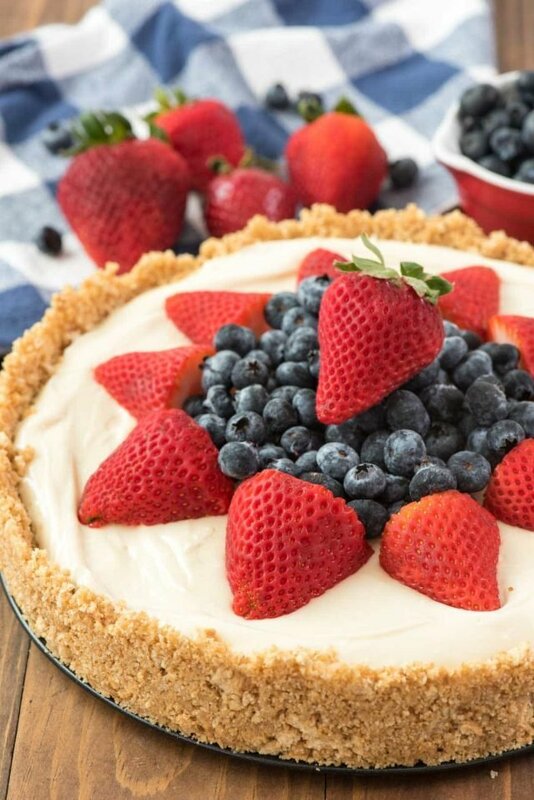 Everyone loves this easy no bake cheesecake recipe! Can you believe it’s mid-may already? Summer is almost here! Memorial Day, 4th of July…I love it all. What I don’t love about summer is the heat that comes to Sacramento, which is why I’ll be making a ton of no-bake recipes over the coming months. But…you guys are okay with that because you love no-bake recipes! And this recipe is the BEST No Bake Cheesecake Recipe I’ve ever had. I mean sure, I love no bake Oreo Cheesecake and even lemon, but this super simple, plain, easy cheesecake recipe? My favorite. It goes down sooooo easy. Plus, it’s pretty. This easy No Bake Cheesecake with condensed milk is the BEST one I’ve ever tasted! It’s so simple to make and so delicious. Dealing with life makes me want CHEESECAKE bad. I had to re-home this cheesecake recipe as soon as it was done because it’s a trigger for me. If not, I would have just taken it to the couch with a fork and gone to town. There’s something so good about a classic cheesecake recipe, right? No frills, no extra flavors, just graham cracker crust and creamy filling. What makes this the best no bake cheesecake recipe? For me, it’s all about the filling. I’ve always ever made no bake cheesecakes using cream cheese and cool whip, but for this one I went with an old standard recipe: cream cheese and sweetened condensed milk. That stuff is like God’s nectar and makes EVERYTHING better. What pan do you use to make no-bake cheesecake? I think a springform pan for this recipe is super important. I have a 9-inch springform pan, but you could use an 8-inch or a 10-inch. A deep dish pie plate would work too, but it’ll be harder for serving. Paired with a homemade graham cracker crust this easy no-bake cheesecake will become an absolute favorite! This really is the BEST No Bake Cheesecake Recipe! Growing up, I was raised on box mix cheesecake. You know the one? It came with two pouches; one for the crust and one for the filling. It came together like pudding mix but it was cheesecake. I loved that cheesecake! Of course, it was “fake” cheesecake, so anything real tastes better. But I still have fond memories of that no bake dessert my mom would make for any holiday or occasion. The best no bake cheesecake tastes way better than a box mix, but it still reminds me of it. Probably because of the thick and sweet graham cracker crust and the sweet and creamy filling. Make sure that your cream cheese is room temperature to avoid lumps. Do NOT use low-fat sweetened condensed milk or it won’t set up. Make sure not to skimp on the lemon juice. It won’t adjust the flavor of the cheesecake but it will make it not set up. I like my classic cheesecakes plain or with fresh fruit. You can also top this with so many things! I also can’t wait to make this into a No-Bake Oreo Cheesecake or top it with lemon for a No-bake Lemon cheesecake. If you don’t like fresh fruit topping, try Erin’s homemade cherry pie filling, or using whipped cream, chocolate sauce, or peanut butter sauce on top. 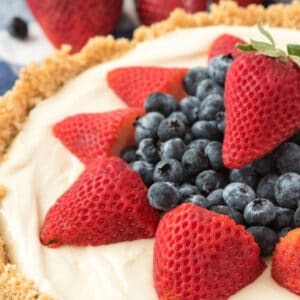 Really, use whatever you like, but I think the best no bake cheesecake is SO pretty just with fresh berries. Also, if you use strawberries and blueberries it’s perfect dessert recipe for Memorial Day BBQs, 4th of July parties, or even Thanksgiving! The BEST No Bake Cheesecake Recipe - this easy cheesecake recipe is completely no bake! 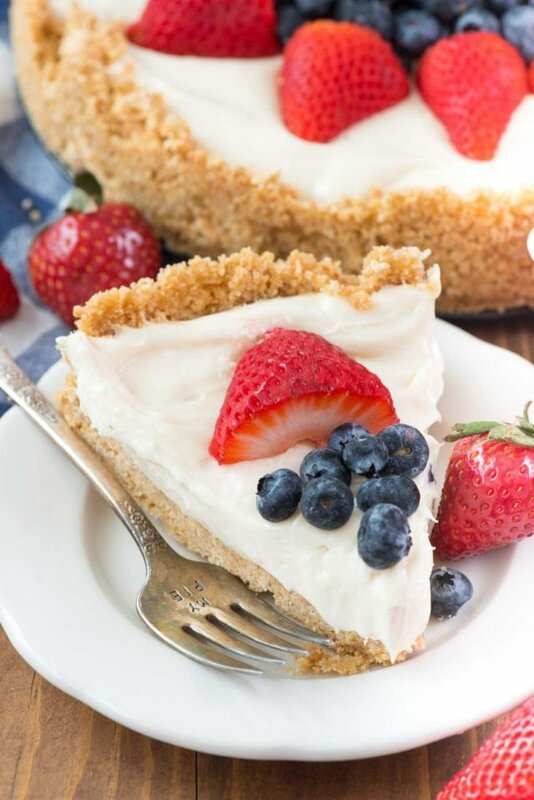 It has a thick graham cracker crust and a sweet cheesecake filling. Perfect for Summer and everyone loves it! Place graham cracker crumbs, sugar, and melted butter in a large bowl and stir using a fork. The mixture will resemble wet sand. Press into the bottom and up the sides of a 9-10” springform pan. Chill at least 10 minutes before filling. Beat cream cheese until smooth using a hand or a stand mixer. Add sweetened condensed milk, vanilla, and lemon juice and mix until smooth and no lumps remain. Pour into prepared crust. Chill at least 4 hours before serving so the mixture can set. Top with berries or your favorite pie filling. Store in refrigerator for up to 3 days. Cheesecake can be made 1 day in advance, but don’t top it until ready to serve. It can also be frozen. If it's having trouble solidifying, freeze for 2 hours. No Bake Lemon Cheesecake – an easy lemon pie that’s also a cheesecake! Oatmeal Scotchie Cheesecake Bars – the perfect combination of oatmeal cookie, butterscotch, and cheesecake! Frozen Peanut Butter Cheesecake – like peanut butter ice cream but better! Wow! Delish looking. I wana replace the sugar in the crust with brown sugar. And use vanilla bean paste instead of extract. This is gona be yummy for my tummy. * I’m the only one eating it! Thanks Dorothy. I promised a co-worker a birthday cheesecake and forgot about it until the night before. I just happened to have all of the ingredients already, so I was up by 6:20 this morning. It was in the fridge by 6:45. SO FAST, and SO easy! I make this often. At first i also had a problem with it setting. I substitute the vanilla exact with one box of vanilla pudding. Problem solved! And the taste is still very good! What size box of vanilla pudding? I’m making a double batch to fit a 1/2sheet. Love you’re No Bake Cheese Cake recipe!! Why the lemon juice? Doesn’t it make the cheesecake taste lemony? Is there any chance I could make this recipe and use it to fill something else? For example; crepes, maybe?